At the age of 18, Genevieve Biggers left her hometown of Tahlequah, Oklahoma and headed east, ending up in Rosendale, New York. She lived with an uncle, then a house full of hippies, then finally headed to New York City where she settled down in Coney Island. Biggers had few positive things to say about her upbringing in poor, rural Tahlequah, a town from which she said few people ever leave. Her father is Cherokee but her mother has European ancestry, and she was picked on as a kid for looking different from her peers. But Biggers set her sights on something more. "My ambition came from within me," she said. Today, the 22-year-old is a starting her freshmen year at John Jay College studying forensic science, a subject that she has been fascinated with since high school. In her junior year, a chemistry teacher took note of Biggers' aptitude for science and pushed her to take an honors course in forensic science. She loved it at the time, but soon after, the interest faded away as more pressing life decisions, such as where to live and how to survive, took over. But Biggers has always had another passion, comic books, which was inspired by watching cartoons with her father as a kid. She has been writing and illustrating comics ever since. "When I was 20, I was reading a comic book about The Flash," she said, "and the character Barry Allen was a police scientist [a precursor to forensic scientists]. That was so cool because it reminded me of this class I took, and rekindled this lost spark that I had." At the time, Biggers was working at an insurance company in Midtown, a "thankless job" in her opinion. 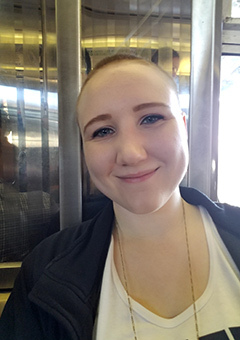 Noticing her renewed interest in forensic science, her boyfriend recommended John Jay College -- several of his friends had attended and a few went on to become lawyers. So Biggers quit her job and enrolled, joining APPLE Corps along the way. She hopes to one-day work for the NYPD. Biggers said that coming into college a few years older and with a vastly different life experience than many of her classmates has been a bit of an adjustment, but she is excited to make new friends and gain new social skills. She even has a vision for synthesizing her interests in comics and forensic science. "Comic books today are not scientifically accurate," she said, "I want to bring that back to comic book stories." Coley was born and raised in Jamaica, and came to New York City when she was 14. Today she lives in Queens. "The transition was really hard, adapting to a different culture and meeting new people was difficult," she said, "but I always said I wanted to become an attorney. 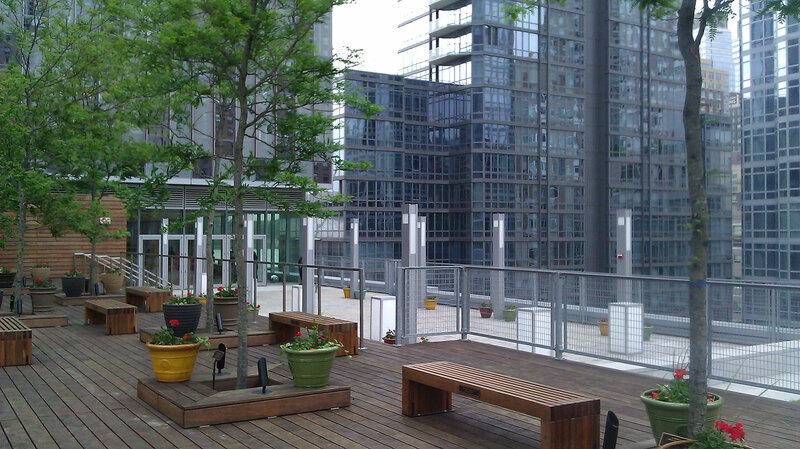 Moving here gave me the opportunity." For Coley, the motivation to become a lawyer is deeply personal. Coley's grandmother lost her home at the age of 70, a scenario that Coley said could have been prevented had the family been able to hire a decent lawyer. "I want to prevent that from happening to other people," she said, "a lot of injustice happens in the world, but it inspires me to help." In the long term, Coley hopes to one day attend law school at NYU and work with the International Court of Justice. But for now, Coley intends to major in criminology and is in the ACE program as well, which she said has given her strong support. She also plans to join the economics club. "I still don't know how to get around that well," she said, "but people went above and beyond to help me." "I just get this feeling when I come to the city that I can do anything. It's good to be here and be able to move forward with my dreams," she said. Frank Gutierrez is not only the first in his family to go to college, he is also a Macaulay Honors student. Born and raised in Bensonhurst, Brooklyn, Gutierrez said he has always valued a strong work ethic, a quality he traces back to his immigrant roots. "Growing up in an immigrant family, you get to see and experience some of the hardship they [his parents] experienced," Gutierrez said. "They inspire me to be a hard worker and to push myself. To know my limits, but explore what those limits are." At John Jay, Gutierrez plans to study both forensic science and law and society, but he said that might change along the way. "You can take a straight path, but John Jay also opens up a lot of opportunities that we might not know are available to us," he said. Gutierrez said he's proud to be a Macaulay student, and is excited about the opportunities in the program such as the New York City Arts seminar. "I'm looking forward to it because they're going to have us go to shows we wouldn't normally go to. I'm also looking forward to getting even closer with my cohort," he said. At Brooklyn Tech high school, Gutierrez was involved in the theater, but not in the traditional sense. He worked with a program called Stage Works as part of the crew, an experience he grew to love because of the teamwork dynamic. "You have to work together to make sure a show runs without any interruptions, and if something goes wrong, you have to work together to fix it as soon and efficiently as possible," he said. Studying abroad is another one of this student's goals. "The program they have in Italy looks amazing, and I found the program in Cuba to be really interesting as well because that's a place that not many people can go to, so to travel there as a student would be an amazing experience." But as with academics, Gutierrez plans to remain open-minded. He said he's also interested in studying in Spain, Eastern Europe, or South America. When it comes to the future, Gutierrez is optimistic. "I like to think I can work both independently and as a team. I like getting my hands dirty and going home tired, knowing that I did work. I think these qualities will benefit me in the future," he said. Sarafina Kadine was born in Ethiopia, grew up in New Mexico, spent her teenage years in Denver, and has traveled to Japan, Thailand, England, France, Germany, and Netherlands. But her most recent destination is New York City. The reason: John Jay College and its top-ranked forensic psychology program. "That's what drew me to the college," she said, "learning about the mysteries of the brain, understanding why people do what they do, why criminals commit the crimes they commit, and how to prevent them in the future. And the professors looked amazing," she added. Kadine first fell in love with psychology in high school, and by then she already had an internship with the FBI under her belt. 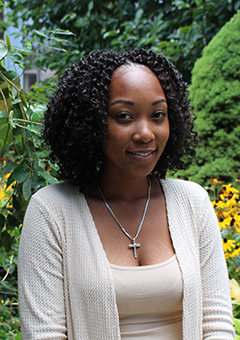 As an honors student at John Jay, she plans to pursue psychology while keeping her mind open to new experiences. Kadine's family is unique -- she has two moms and two younger sisters, who are also adopted from Ethiopia. She said her moms "have been very inspiring to me. They have a 'you need to work for what you want' attitude. That's where I get most of my determination from," she said. 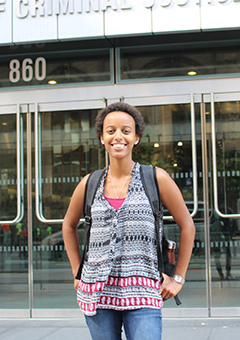 One of Kidane's moms worked for an airline for a time, one of the reasons this first-year student is so well traveled. "Traveling to different countries is a big part of who I am as a person," she said. "Being to those places has opened my eyes to world around me." In fact, the reason Kidane's family moved from New Mexico to Denver was to be in a more diverse community. "My parents always told me a lot about my heritage," she said, "and Denver has a big Ethiopian community and good Ethiopian food." Walking down the hallway of her high school, Kadine said she could hear several different languages being spoken -- not unlike being at John Jay. While New York City is a totally different place than Colorado, Kadine has found a community in the off-campus housing at the New Yorker hotel. "I like it a lot," she commented, "I was worried about dorm life, because I used to be more of an introvert. But I'm learning that living with someone you don't know can be exciting." 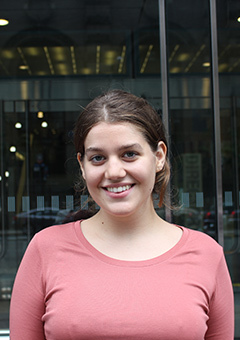 Clara Wilhelm, an international student from Nuremburg, Germany, came to John Jay College to study international criminal justice. Although she considered studying art at a few different institutions, she chose John Jay because the program is "focused and offers a direct pathway to my goals," which Wilhelm said appeals to her orderly German sensibility. "Crime is like a puzzle," she said, "there are so many pieces that go into it, especially with international crime. It's always different, always new, and it's always developing." 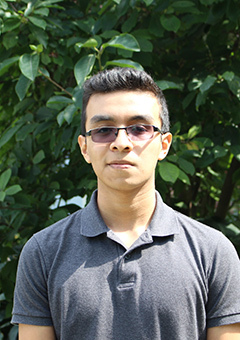 Wilhelm, who is also in the honors program, comes from a family that values education. Her father is an oncologist and her mother was in banking before she began working with NGOs involved in the refugee crisis. While they might not be used to paying college tuition (most German universities are free), Wilhelm said it's worth it because John Jay is "everything I ever wanted." And it won't be the first time this student has lived in a foreign country. When she was 14, Wilhelm traveled to Hong Kong where she lived with a Chinese family and attended a Chinese school for a year. "That year I did a complete 360," she said. "It showed me that there's so much out there, and if you go to a different country or continent there are so many opportunities. Now, I'm constantly seeking that." Wilhelm said that living in NYC is not as difficult an adjustment as living in China, and that the pace of life here is a good balance between the organization of Germany and the hectic chaos of Hong Kong. But there is still a learning curve, such as figuring out how a GPA works, or remembering to put the month before the day when writing out the date. And like most Europeans, Wilhelm is immensely pleased with the fact that she is offered free water at restaurants. "I've been very hydrated recently," she laughed. In the long term, Wilhelm aspires to work for Interpol. "I think the international approach to crime is so important," she said, "if you're enforcing drugs coming into America from Mexico, you should be talking with the Mexican authorities, but national agencies are legally limited to stay within certain boundaries." When it comes to college, Wilhelm displays a single-mindedness not typically apparent in most freshmen. "In Hong Kong, I was able to explore the city and discover myself. But I feel kind of done with that. Now, I'm ready to focus and get stuff done."